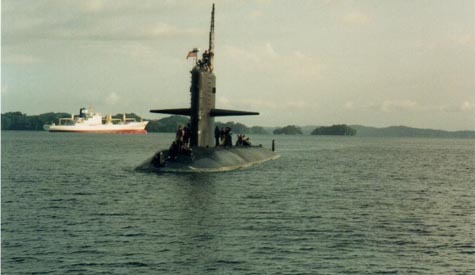 The third Narwhal was laid down 17 January 1966 by General Dynamics Corp., Groton, Conn.; launched 9 September 1967; sponsored by Mrs. Glynn R. Donaho; and commissioned 12 July 1969, with Comdr. W. A. Matson, in command. The Narwhal is the largest straight nuclear-powered attack submarine yet built by the U.S. Navy. She has a new type of reactor that will enable her to steam longer, and further than any other submarine in existence. This new reactor considerably reduces the noise level of a submarine and makes the Narwhal, at the time of commissioning, the quietest submarine in the U.S. Naval service.